Previously I wrote about Tenvis cameras on Zoneminder, but now something new, but surprisingly similar in many ways. 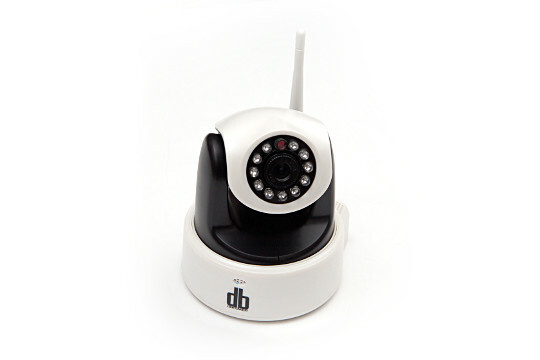 I've been playing with cheap DB Power 720p IP cameras. These appear to be re-badged MayGion cameras though I suspect there are many similar variants out there. This article goes through a load of extra things that you can do with this camera which may not be available in every version of the firmware, or worse may brick you camera. This article assumes a in-depth understanding of Unix / Linux for all but the most basic configuration described here. If you are unsure or don't want to brick your camera then stop now. On power up these cameras configure themselves on 192.168.1.111/24 with a gateway of 192.168.1.1 on wired ethernet which makes it very easy to configure a laptop on that network to configure them. The web interface on port 81 hence you end up with http://192.168.1.111:81/ after which the username and password are both "admin"
As it turns out these cameras have telnet open... yeah, straight into an unauthenticated shell! But very minimal busybox once you get in (no editors of any type!) so to do anything interesting a bit more work is needed. This has both advantages and disadvantages: it's great to start poking around with the camera, but at the same time it rather blows things open so far as security when you can get OS access without authenticating. These days if you don't have an API then you aren't alive... well, if you code anyway. So far as I can tell this is a MayGion camera (or relative) and the API seems to work accordingly. I found the busybox-mipsel download works and has plenty of extra functionality as well as an editor (vi). Due caution needs to be used when downloading and using unknown binaries. Since the internal storage of the camera is pretty near full, the busybox binary will need to go on an SD card. When the camera boots it positions it's self to a preset "center" position, but that's not very useful if you have set it up to be in a specific position and it gets rebooted - your CCTV recording ends up being of something other than what you wanted. This defines the position that the camera will point at boot. This camera has a few quirks and one is that if it is isolated from the internet it will sit and repeatedly reboot. It seems it's trying to reach servers on UDP port 10240. From what I can work out this is to do with the P2P feature and disabling this stops this behaviour if no internet connection. Obviously you will need to start off with an internet connection to be able to disable this. 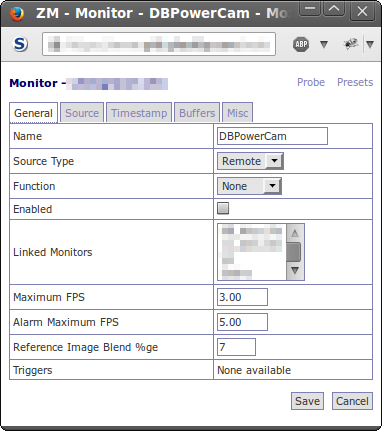 Irrespective of the DNS servers that are configured the camera will lookup NTP servers from 8.8.8.8 (Google's public DNS) which just means that on an isolated network or when given NTP servers that are not public this will fail. This appears to be hard-coded in the firmware (D'oh!) so a work around will be needed. The moment the camera has a SD card it records video the the card. Fine if that's what you want, but as I'm using Zoneminder I just want to use the SD for things like the more capable busybox (only ~200k free on internal storage) rather than video. To prevent recording you have to unhighlight everything in "Schedule Record" to stop recording to SD. I decided to try a newer version of the firmware which turned out to be a bad idea. First off the actual OS doesn't seem to be updated. The application (binary) that controls the camera and the web files (html & images) are what gets updated. If the application fails to work then the camera might sit and reboot endlessly as happened to me. In my case I found there was a small window of a couple seconds after boot to telnet in, and run ps. Once you have identified the PIDs for the "applauncher" and "cs" processes which seem consistent between boots, the next boot you can telnet in during the brief window and kill these two processes to stop the rebooting. After that I could use pftp to put files back from the backup I took earlier, of course remembering to switch to bin mode to ensure files are not corrupted. 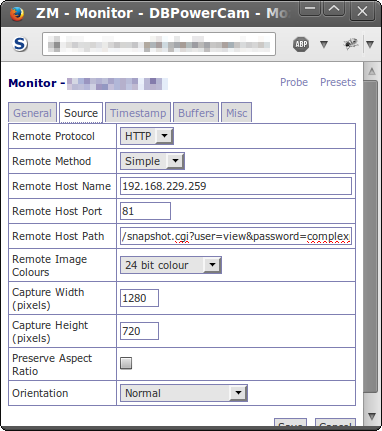 Credentials for ftp are the standard ones used for the camera. The /etc/local-dhcpd-commit-wrapper script will need to check the arguments and determine if it should run the script to kill telnetd. I also do other stuff in my script like turning on lights at night when my phone connects to to the WiFi as I arrive home. Zoneminder configuration for this camera is very similar in configuration to what I did for the Tenvis Cameras previously except that everything other than credentials gets ignored with this camera. Choose your function, if you want a motion detected recording then "Mocord"
This should have the camera working in Zoneminder provided it's all happy with stuff like shared memory for buffers and any remaining generic configuration.